Hi friends! Letting you know that this post is sponsored by Pacific Foods. 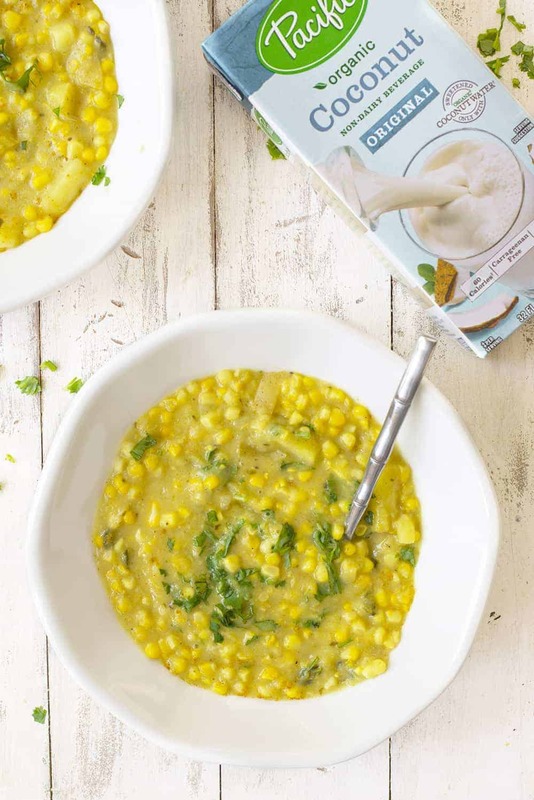 As their dairy-free beverage ambassador this year, I’m excited to bring you this fresh corn chowder recipe using their coconut milk. Soup in the summer? YES. Soup in the summer. 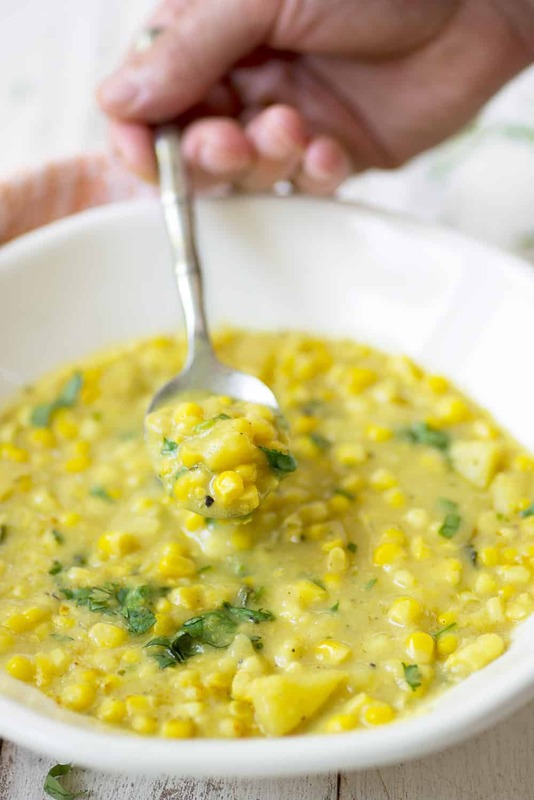 Fresh corn chowder in the summer to be exact, the only acceptable time you should be making and eating it. It’s corn season! A fact that my husband reminds me of daily because he really, really loves the stuff. I suppose that’s what happens when you grow up in rural Wisconsin; once July hits you know that fresh sweet corn is almost ready. I don’t love corn quite as much as BL, but I do love corn chowder. Creamy corn chowder with a hint of sweetness from the corn; so fresh you can taste it in each refreshing bite. Besides gazpacho, it’s the only soup that I regularly make in the summer. This is a lighter version of traditional corn chowder. Gone is any heavy cream, 1/2 pound of butter or whole milk. Instead it’s a base of sautéed sweet corn, onion and poblano pepper. I added in a little curry powder to help balance the sweetness but not too much that this tastes like a curry dish. 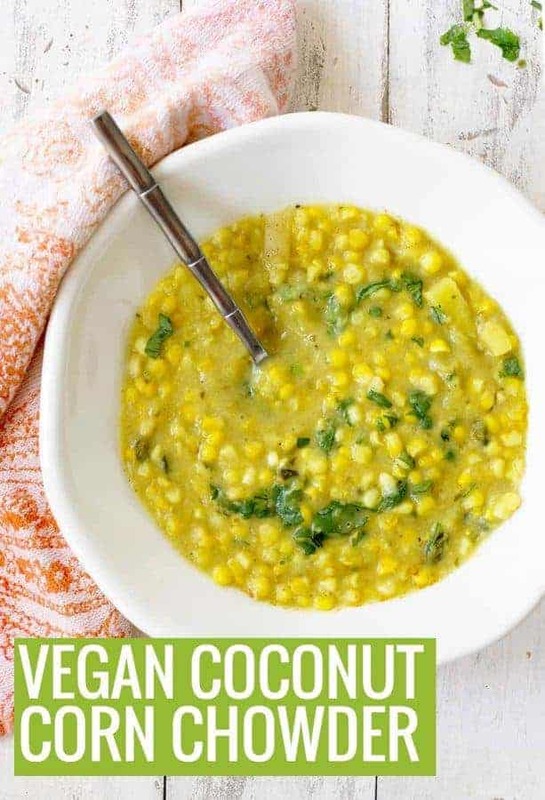 It’s subtle, spicing the corn perfectly. The other secret to creamy corn chowder without the dairy? Pacific Foods Organic Unsweetened Coconut Plant-Based Beverage. This one is a staple in our house. 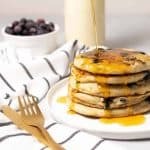 It’s light enough in coconut flavor so that is doesn’t over power the recipe while still letting the refreshing taste of coconut shine through. It adds body, creamy texture and flavor without a a lot of fat and calories like canned coconut milk. 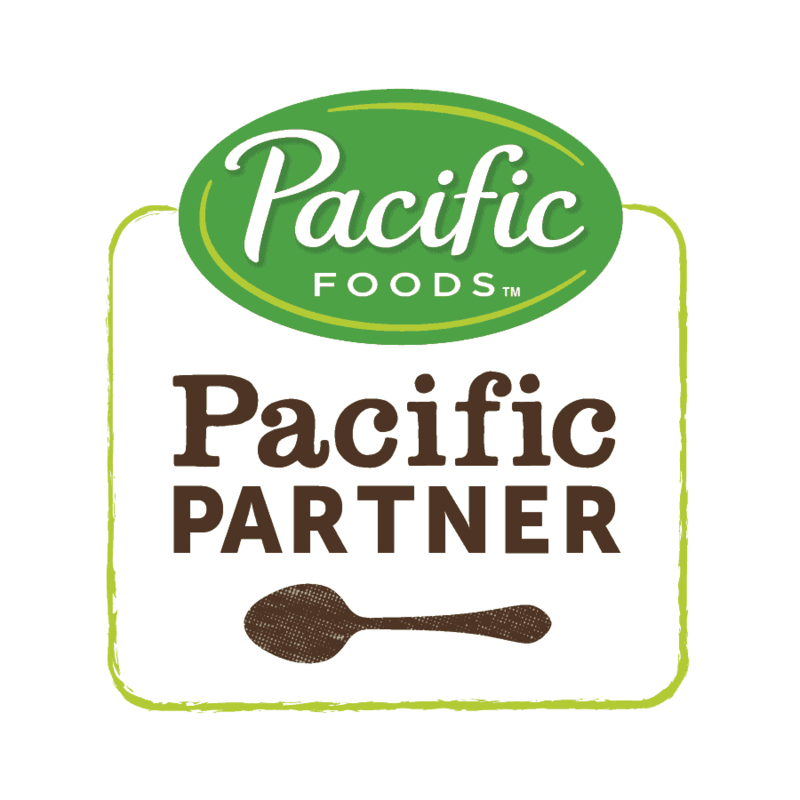 Pacific’s organic coconut beverage is only 45 calories per cup and doesn’t contain additives like carrageenan. It’s also fortified with vitamin B12 and vitamin D, two nutrients that can be hard to get for plant-based eaters. As Pacific’s dairy-free ambassador this year, I’m excited to showcase another one of their options. 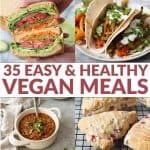 If you missed it, I made a delicious spicy pasta using their cashew beverage, vegan scones using their oat beverage, a strawberry oat smoothie bowl and a baked oatmeal using their hemp beverage. Safe to say that we are really big fans of their products. Once the chowder has finished simmering, you’ll puree 2 cups of it in the blender before adding back to the soup. Just another trick for creamy chowder without any dairy! The potatoes and corn puree into a thickened cream that gives even more body to this finished soup. Add in a squirt of fresh lime juice and chopped cilantro for a perfect finish. Since this soup is so refreshing, you don’t have to serve it piping hot. I usually remove it from the heat and let it sit for 10-15 minutes before serving. Coconut Corn Chowder! 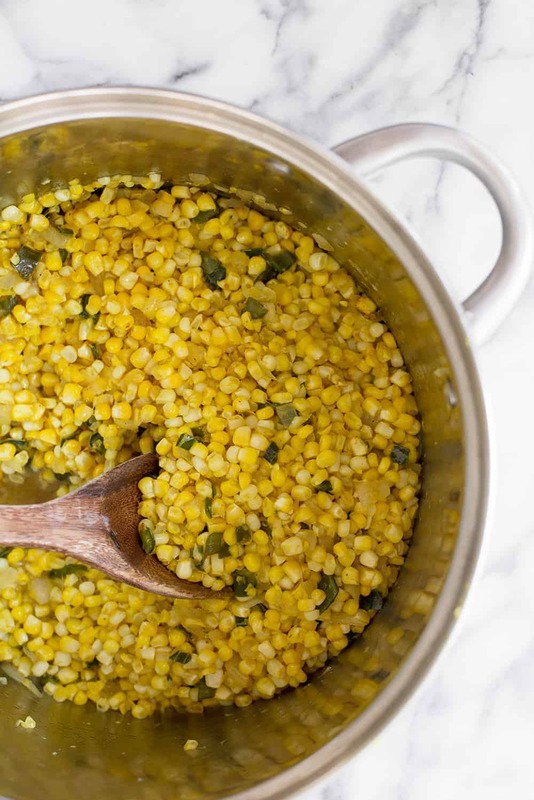 The PERFECT recipe for summer corn! This light soup is packed with fresh corn, poblano peppers and coconut beverage. Everyone who tries this soup raves about it! 4 cups Pacific Foods Organic Unsweetened Coconut Plant-Based Beverage. Heat the coconut oil in a large soup pan over medium heat. Add the onion and cook until soft, but not browned. Add in the garlic, curry powder, salt and poblano pepper and cook another 5 minutes until poblano is softened, taking care not to let the garlic burn. Add the corn and cook for another 5 minutes, letting the kernels soften. Sprinkle the flour in and stir until absorbed and flour is no longer visible. Add the potatoes and coconut beverage and lower heat to low. Let simmer for 20-25 minutes until potatoes are softened. Remove 2 cups of the soup and puree in a blender, then add back to the soup and let cook for 5 more minutes to combine and re-heat through. Season to taste, adding more salt/pepper if needed. Stir in the lime juice and cilantro, if using, then serve. Disclosure: This post is sponsored by Pacific Foods. We are BIG fans of all of their products, especially their non-dairy beverages. Thanks for supporting the brands that make DK possible. Hi, if you wanted to make the corn chowder gluten free, what flour would I substitute ? Coconut, almond? Potato? I’m asking because I don’t use/have GF flour. Hi Jayne, hm- I think any of them should work, but if you don’t have any gluten-free flour at home, then you can make your own with oats- just process in a food processor until a flour forms. You can use a 1:1 GF flour also, but you don’t need any of the stabilizers that they contain as this is just to thicken the sauce, not leaven anything.